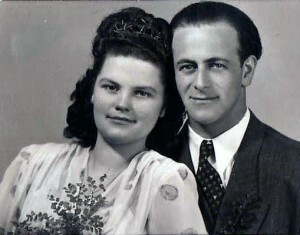 Jacob Hennenberg was born in 1924 in the Polish city of Oswiecim (Auschwitz). He was 15 years old during the 1939 invasion of Poland by the Nazi military. 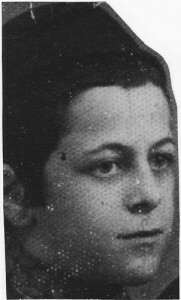 In March 1941, the Germans forced the Jews of Oswiecim, Jacob’s family included, to relocate to the Chrzanow ghetto in occupied Poland. Soon, the Germans began capturing people from the Chrzanow ghetto to be taken to forced labor camps. In May 1941, the Germans took Jacob to a labor camp in the German city of Wiesau. He would never again see his father or three of his four sisters. 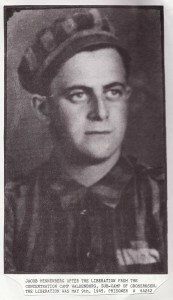 From 1941 to 1944, Jacob would work in forced labor camps in German cities of Wiesau, Sakrau, Klettendorf, and Freiburg. In 1944, Jacob was taken to the Waldenburg concentration camp. Forced labor camps were run by the German police, while the more ruthless German SS ran the concentration camps. In Waldenburg, his tormentors knew Jacob as number 64242. Much like Roman numerals, the letters of the Hebrew alphabet are assigned numbers. Jacob likes to point out that the sum of this numbers 64242 is 18. Eighteen in Hebrew consists of two letters Chet and Yud, which spells the Hebrew word Chai (life). A day at Waldenburg, for its 700 Jewish prisoners, consisted of rising before daybreak. Following roll call, the prisoners were marched to work. They returned in the evening to the barracks to the only meal of the day consisting of a ration of soup and bread. Prisoners who became sick or unable to work were put to death at the Gross-Rosen concentration camp twenty miles away. Jacob, as a bricklayer, was given food from the storage facility. He feared that since he did not look as emaciated as the other prisoners, he would be found out. The Soviet army liberated the Waldenburg camp on May 8, 1945. Jacob’s picture (right) was taken just after the liberation. Jacob met his wife Hilda in Weiden, Germany, at the end of the war. He took a job with the United States Army. In July of 1949, Eugene Freedheim, an attorney in Cleveland, Ohio, sponsored the immigration of Jacob, Hilda, and their infant son Michael, to the United States. Now retired from the drapery business, Jacob, is dedicated to remembrance of the Shoah (Holocaust). He lectures to area schools and other groups as well as working on other Shoah events. 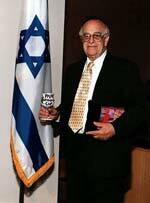 He is a member of Kol Israel Foundation—organization of Holocaust survivors. His mission is to not let us forget the Shoah. For if we forget, it can happen again. AM ISRAEL CHAI.